Designer, illustrator, and mural artist Lauren West's work is filled with vibrant colors, nature, and a bit of whimsy. 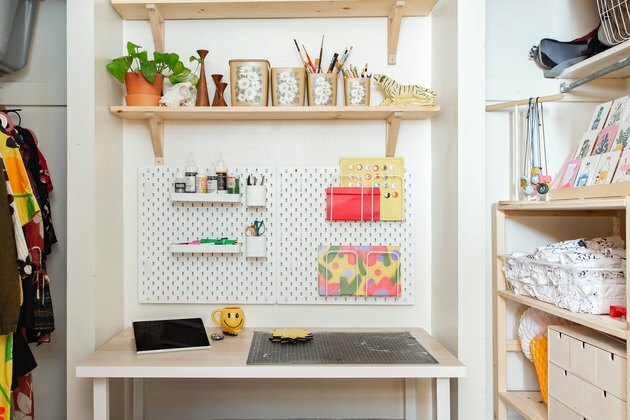 So it's no surprise that she brought the same cheery elements to her home and studio in South Philly. West has lived in the apartment, which she shares with her two cats, Lunchbox and Scooter, for three years. 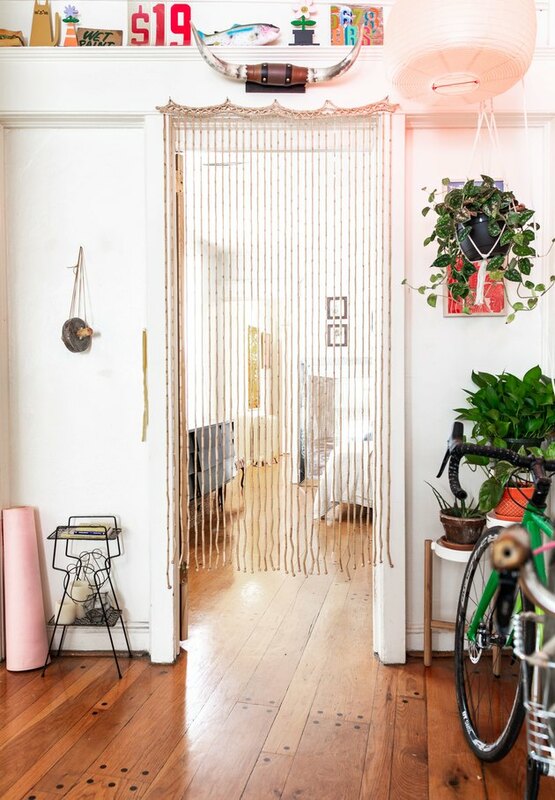 "It's what some would call a 'railroad style' apartment, where it just goes straight back with little to no separations by a hallway or separate room," she says. "It's quirky. I noticed there is maybe, MAYBE, one 90-degree angle on the walls — everything is built slightly skewed." 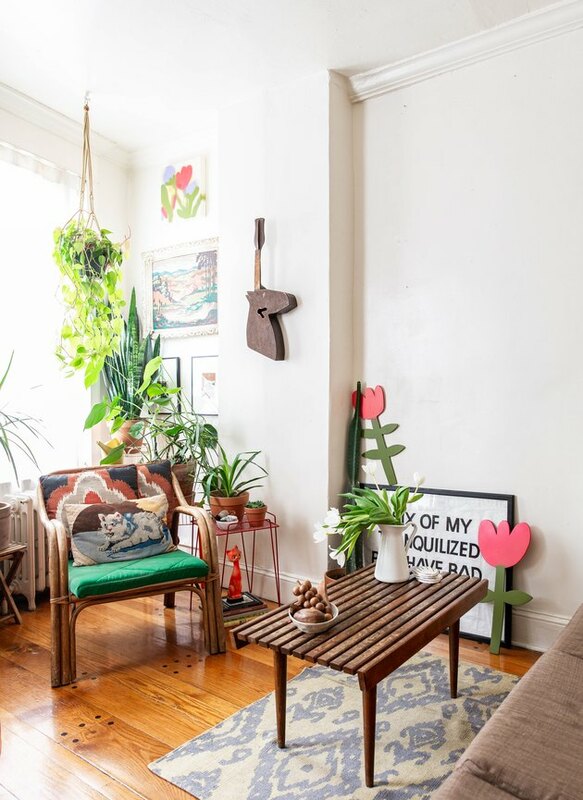 But for all its eccentricities, the apartment had some major selling points, including original moldings, detailed door frames, an amazing wood floor with inlaid nail covers, and, West emphasizes, lots of natural light. 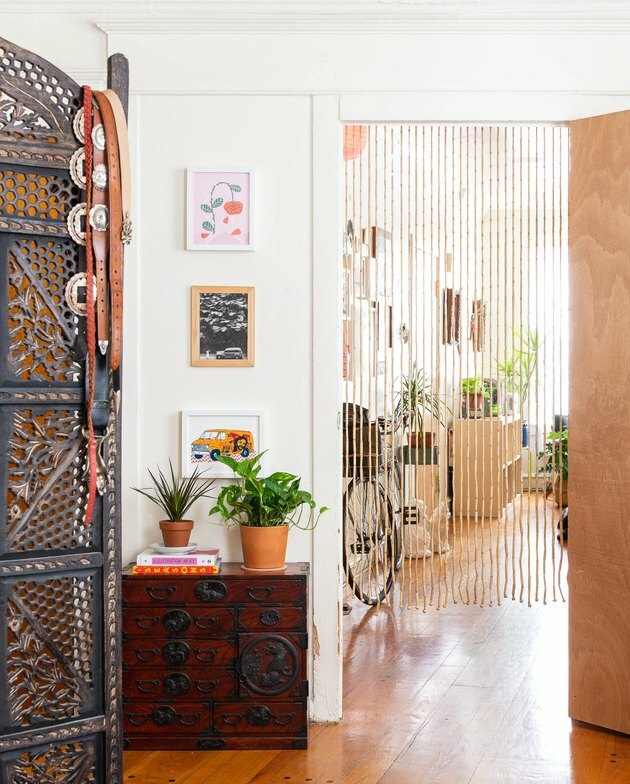 The space is primarily decorated with pieces from estate sales, flea markets, and thrift stores. 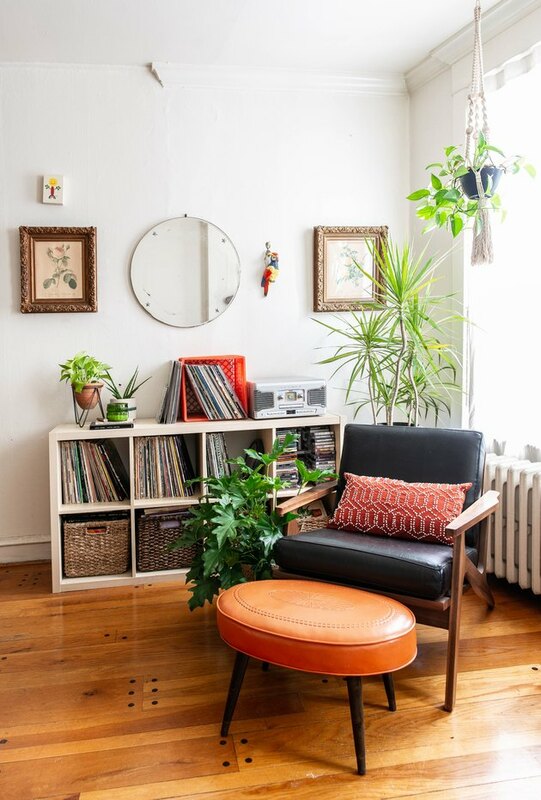 "I love the quality of older furniture over a lot of what's currently available," she says. West also isn't afraid of mixing things up, which is why you'll find everything from cat sculptures to framed botanical prints on display. 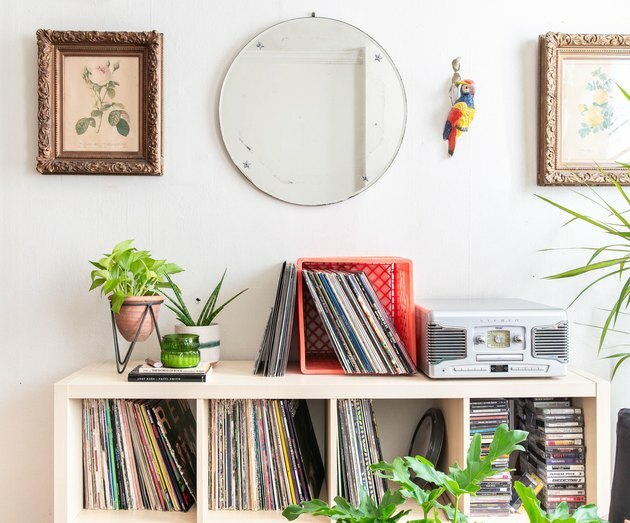 "I love collecting vintage weird little knick-knacks, so you'll find artfully curated clusters of tchotchkes everywhere," says West. "My home is cozy and light. It's green and full of energy. It's inviting and so, so weird," she shares. "It's definitely me in house-form, 100 percent." West's favorite space in the apartment is the living room, which is filled with light all day long. 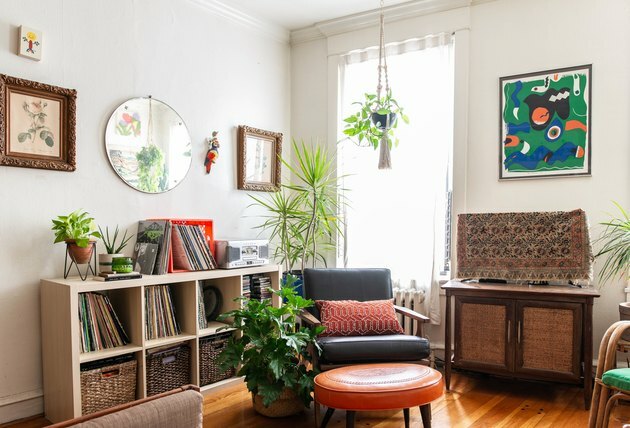 "My plants are super happy in there and my cats can sunbathe in their own front windows," she says. 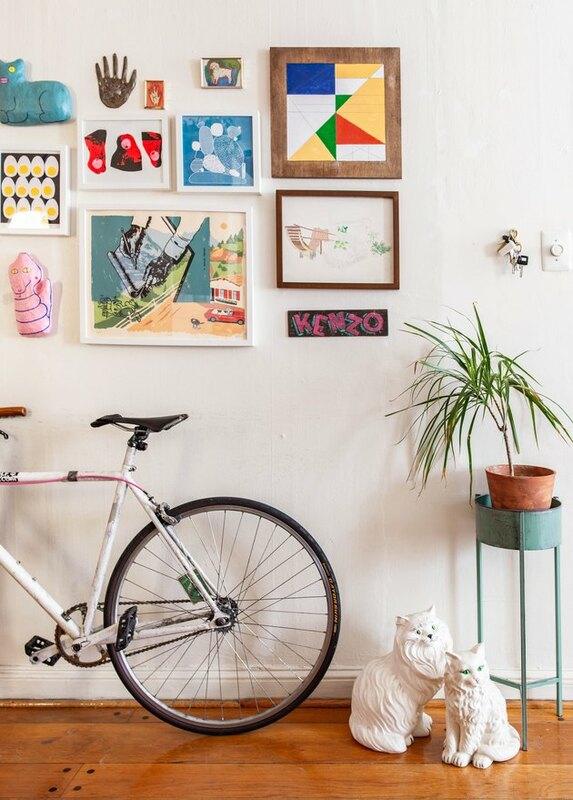 West displays an array of artwork throughout the apartment. 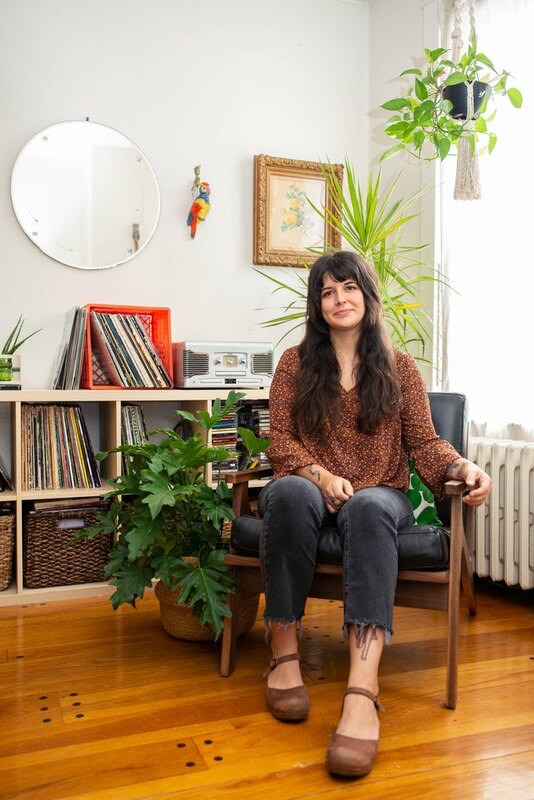 "I'm really thankful to be a part of the Philadelphia art community and over the years have had a chance to collect work from friends and people I admire — and have a ever-growing gallery wall filled with prints, paintings, and sculptures," she says. More tchotchkes decorate the stove. 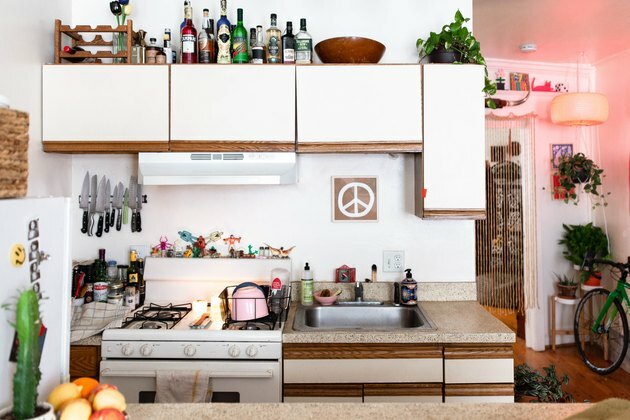 West uses the space above the cabinets for bar storage. Even though the space is a rental, West has been able to make it her own. 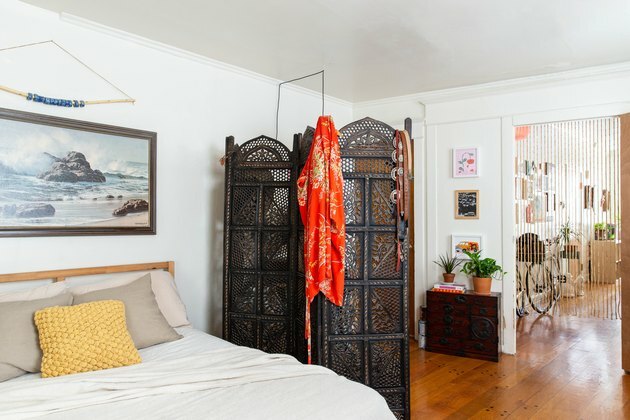 "My landlord is very relaxed when it comes to any customizations or modifications to the house because he knows I'll have no trouble putting it back to its original (maybe even more-improved) form." West topped the living room's midcentury furniture with colorful and quirky throw pillows. West has found pieces for the apartment at some of her favorite vintage stores in the area including Jinxed and Mid-Century Furniture Warehouse. She also loves to pick up minimalist housewares at Omoi Zakka Shop. West created a studio space in the closet, complete with vintage containers to hold brushes and pencils. The apartment's white walls allow the artwork and colorful textiles to be the focal point of the space. 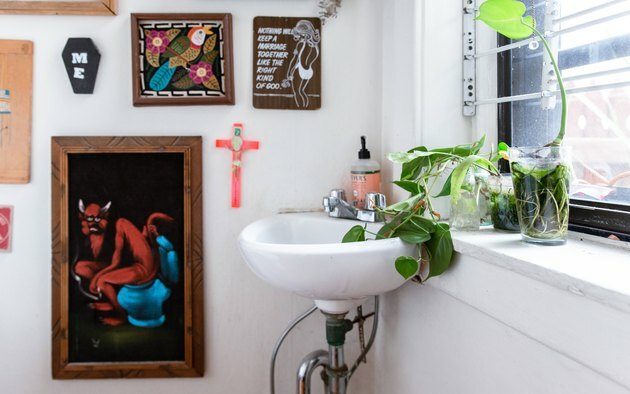 "I love my half-bathroom because of all the small tchotchkes that fill the space from floor-to-ceiling," says West. 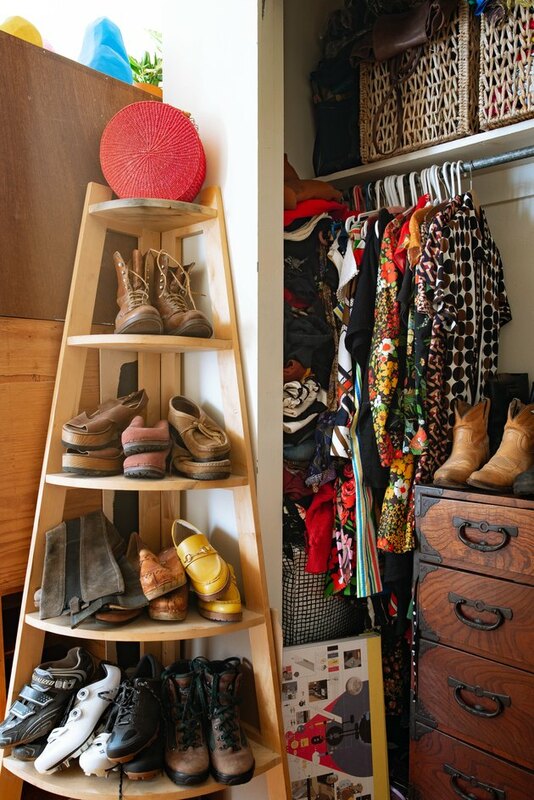 West's love of color and pattern extends to her closet. 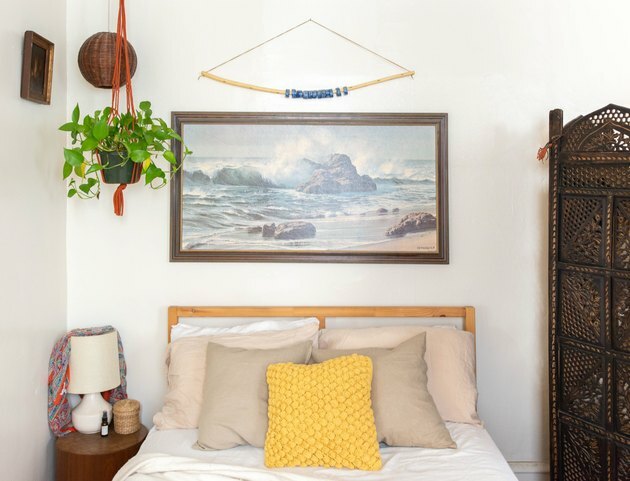 Plants brighten every room in the home, even the bedroom and studio. "I love that it has a 'backyard'," she says. "And by backyard, I mean concrete slab." Given that outdoor space is rare in the city, West has filled the 8-feet-by-40-feet area with plants and added seating for entertaining.